The projects displayed within this website have now all been completed. Of course, they will remain on the website in order to be accessed by readers of the website, and to stimulate existing and future research projects. 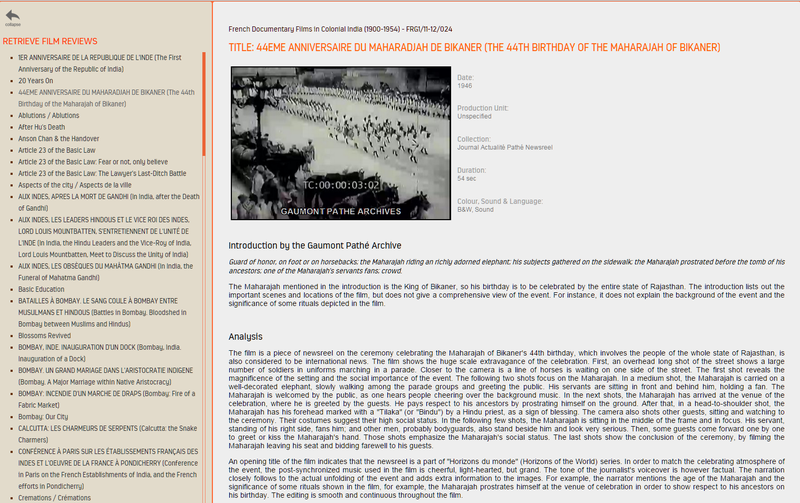 The material on the website mainly concerns the official film in Britain, Malaya/Malaysia, Singapore, Hong Kong and India during colonial and post-colonial periods. A considerable number of archival documents relating to this are available on the website, and these have been cross-referenced, and also supplied with brief analyses. 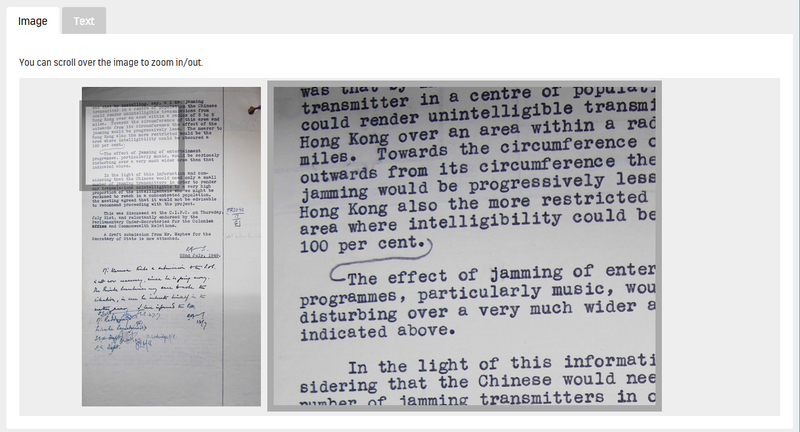 The documents are also made available in their original form, photographed as images, in order to facilitate research. In addition, to this material on the official film, television current affairs broadcasting in Hong Kong is also covered, featuring reports and film analyses of films made by the Hong Kong broadcasters RTHK, TVB and (the now departed) ATV. It is, however, now time to move onwards and look ahead to new projects and research orientations, although, of course, all that relates to the current title of the website: ‘The Documentary Film in South and South-East Asia Research Programme’, will remain on the website, and, hopefully, will continue to inform and facilitate future research. The new orientation planned relates to the general issue of cinematic realism and all that pertains to that issue, including going beyond documentary film to cover the feature film. Consequently, the website will now be renamed under a general title of ‘Cinematic Realism – Documentary Film Website’, with ‘The Documentary Film in South and South-East Asia Research Programme’ as an extant and ongoing sub-category of that. The re-addressed website will, therefore, cover the official film in Britain and South-East Asia, general issues related to documentary film theory, television current-affairs broadcasting in Hong Kong, and general issues relating to cinematic realism. Whilst continuing to have a focus on the South-East Asia region, therefore, the website will now cover general theoretical issues on cinematic realism, regardless of region. The section on cinematic realism will be initiated by posting up the ‘Introduction’ from Aitken (ed.) (2016) The Major Realist Film Theorists. This long ‘Introduction’ (18,000 words) will, hopefully, help to fuel a debate on the issue of cinematic realism. In its first year of operation the website has been quite successful, recording almost 30,000 visits. Hopefully, we can now advance further from this point. From the 1910s to the emergence of structuralism and post-structuralism in the 1960s, the writings of John Grierson, Siegfried Kracauer, André Bazin and Georg Lukács dominated realist film theory. In this critical anthology – the first collection to address their work in one volume – a wide range of international scholars explore the interconnections between their ideas and help generate new understandings of this important, if neglected, field. Challenging preconceptions about ‘classical’ theory and the nature of realist representation, and in the process demonstrating how this body of work can be seen as a cohesive theoretical model, this invaluable collection helps to return the realist paradigm of film theory to the forefront of academic enquiry. The documents available for scrutiny on this website have been collected over the course of more than five years. The research was funded by six Hong Kong government grants and various internal HKBU grants, and covers the colonial official film in Hong Kong, Singapore, Malaya, Malaysia and India. The majority of the documents were written by government officials and deal with the use of the official film in the South and South-East Asia region over the period from 1945 to the 1970s. These documents reveal the process of colonial withdrawal from the region, the project of nation building and the role played by the official film in that. As such, they offer insight into the region at the end of empire and during the first phase of independence. The material has already seen publication in one book, various book chapters and several journal articles, and more are planned, including an edited anthology (Aitken and Deprez, eds) on the colonial film to be published in 2016-17 by Edinburgh University Press, and a research monograph (Aitken), to be published in 2016-17 by Palgrave Macmillan. Please retrieve documents by selecting the criteria and/or by doing a search. 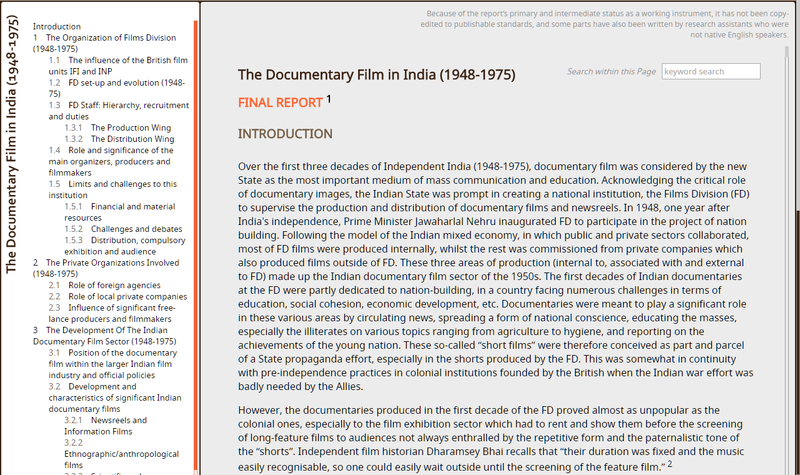 These documents provide a working resource for scholars and should be considered as research-based drafts, containing information on and provisional analyses of films and film-related (including contextual) matters. Because of their primary and intermediate status as working instruments, most of them have not been copy-edited to publishable standards. This report attempts to assess the main similarities and differences between documentaries made within and outside Films Division, documentary-based TV programmes, important commercial feature films and art films over the period 1948-1975, in terms of content and form. These interviews were conducted in India and elsewhere in 2015/16 with 25 important Indian documentary film scholars, filmmakers, and professionals involved in the production, distribution and exhibition of documentary films in India. Their first-hand and personal insights provide exclusive and rare oral testimonies on the lesser-known history of the documentary film in India. “Berita Singapura” (Singapore News) was produced by Cathay Film Services. In 1960, Cathay Film Services was commissioned to produce a series of films called “Peoples’ Singapore”. These films were overt mouthpiece of the government, and did not attempt to conceal that fact. 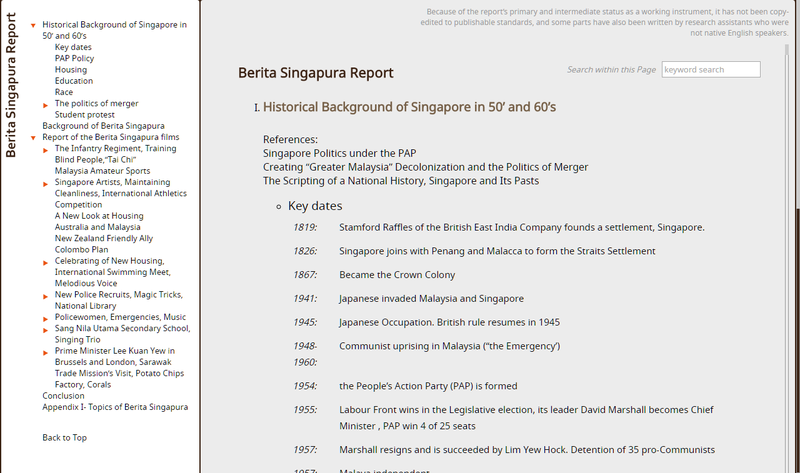 “Berita Singapura”, started in 1963, was difference from the more propagandist “Peoples’ Singapore”, in Berita Singapura”, government policy and ideology were intentionally obscured by a public-relations strategy aimed at conveying the impression that the “Berita Singapura” films and film-makers were semi-independent of government, and were attempting to deliver a disinterested and impartial account of the condition of Singapore. The principle task was to promote the notion of Singapore as an interracial society, with a hybrid culture, existing within the boundaries of a unitary nation state, which served its various ethnic groups without discrimination.